Why should the princesses get all the glory? In CHARMING: A TALE OF AN AMERICAN PRINCE, Bret Shuford tells the tale of one prince’s trek from the faraway Kingdom of Texas to a castle in The East Village. Shuford’s quest is highlighted by the music of Sondheim, Lutvak, Prince and more, with a little Disney magic thrown in for good measure. Friendship bracelets, giants and perhaps even a furry woodland creature help guide this prince along the way. Will he get his “Happily Ever After”? With musical direction by Tracy Stark and direction by Lennie Watts, the solo cabaret show written by Shuford and Watts is hosted by the College of Charleston Department of Theatre and Dance. Shuford was bitten by the theatre bug at a very young age and has spent the last 20 years working in New York City. In addition to working as a Broadway actor, he found a passion for being a content creator, director, choreographer, producer and collaborator with other artists. 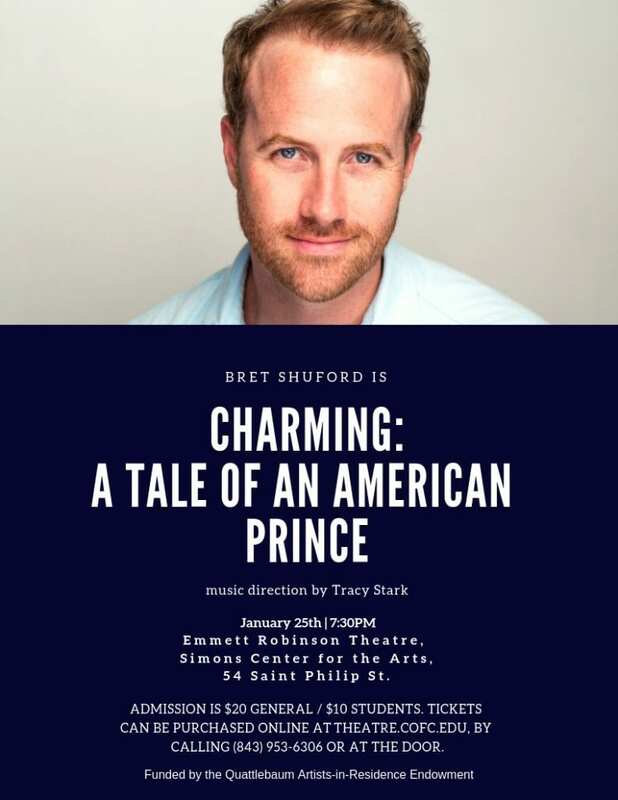 CHARMING: A TALE OF AN AMERICAN PRINCE will take place on Friday, Jan. 25, 2019 at 7:30 p.m. in the Emmett Robinson Theatre, Simons Center for the Arts, 54 Saint Philip St. Admission is $20 general / $10 students. Tickets can be purchased online at theatre.cofc.edu, by calling (843) 953-6306 or at the door. Funded by the Quattlebaum Artists-in-Residence Endowment, Shuford is spending the 2018-2019 academic year working directly with students in the College’s Department of Theatre and Dance. Last fall, he conducted lectures, workshops and masterclasses on various acting and arts management skills. This semester, in addition to his cabaret show, he will direct the musical URINETOWN, (April 11-16) part of the College’s current theatre and dance season. Also, on April 18, Shuford will give a free presentation titled “Business of Broadway.” With its origin dating back to 1985, the College’s Quattlebaum Artists-in-Residence Endowment has helped connect students and the community to renowned artists, such as visual artist Christo, pianist Leon Fleisher, photographer Duane Michaels, former NEA Chairman and actor Jane Alexander, and visual artist Htein Lin, among many others. Shuford’s Broadway credits include Cirque Du Soleil’s Paramour, Amazing Grace, Chitty Chitty Bang Bang, Beauty and the Beast, and The Little Mermaid. Other N.Y. credits include Actors Fund Benefit performances of A Wonderful Life, Best Little Whorehouse in Texas, On the Twentieth Century, and the Radio City Christmas Spectacular. Shuford’s credits outside of New York City include the National Tour of Lincoln Center’s South Pacific and Dr. Fine/Dr. Madden in Next to Normal at the Adirondack Theatre Festival. He originated the role of Vernon Castle in Castlewalk, a new musical presented as part of the New York Music Theatre Festival. He has sung with the Indianapolis Symphony Orchestra, Pittsburgh Symphony, Baltimore Symphony, and the Fort Worth Symphony. Shuford also has been seen on TV and Web series including Law and Order SVU, Alpha House, Submissions Only, and My Dirty Little Secret. His film credits include Scorsese’s The Wolf of Wall Street, Bedfellows, and Uncle Melvin’s Apartment.